يقع فندق Wylie Court Motor Lodge، المصمم ليناسب كل الضيوف سواء كانوا من رجال الأعمال أو السياح، في مكان ممتاز في أحد أكثر المناطق تفضيلاً في مركز مدينة روتوروا. يمكن من هنا للضيوف الاستمتاع بسهولة الوصول إلى كل ما تقدمه هذه المدينة النابضة بالحياة. يضفي محيط الفندق اللطيف وقربه من ‪Statue of Jean Batten ( Jean Batten Square )‬, ‪Whakarewarewa: The Living Maori Village‬, تي واكاريواروا سحراً خاصاً على هذا الفندق. إن الخدمات الممتازة وحسن الضيافة العالي في Wylie Court Motor Lodge تجعل إقامتك تجربة لا تنسى. لضمان راحة ضيوفه، يقدم الفندق الخدمات التالية: واي فاي مجاني في جميع الغرف, مرافق مخصصة لذوي الاحتياجات الخاصة, واي فاي في المناطق العامة, صف السيارات, خدمة الغرف . بالإضافة لهذا,تتضمن كل غرف الضيوف مجموعة واسعة من وسائل الراحة . بعض الغرف توفر حتى تلفزيون بشاشة مسطحة, مسبح خاص, اتصال لاسلكي بشبكة الإنترنت (مجاني), غرف لغير المدخنين, تدفئة لإرضاء أكثر الضيوف تطلباً. إن حمام سباحة خارجي, مسبح (للأطفال), حديقة هو المكان الأمثل في الفندق للاسترخاء وتفريغ طاقتك بعد نهار طويل. استمتع بخدمات لا يعلى عليها وعنوان ذو اعتبار في Wylie Court Motor Lodge . The biggest letdown was that we kept getting second hand smoke coming through windows in several occasions although the premise was strictly non-smoking. The host listenend to my complaint and would have taken necessary action but there is not much he could do to stop it totally. The linen was a bit smelly so I asked the housekeeping team to replace them and they did so promptly. I think it pays a third person (Other than the housekeeping team) to occasionally (If not every day) to do a thorough room quality checks, bearing in mind that this has happened in several other properties during my recent New Zealand trip. Nice Property Located on the Main road, All rooms had private Jacuzzi, apart from common Temperature Controlled Swimming pool. Nicely Maintained, with rooms with 2 Double Beds one on Ground and another on 1st floor with internal Stairs. Only disappointment was that the bathrooms did not have any lock. Simple but lovely. A good choice in the area. Its an older hotel... was an ok value. Beds were comfortable, it was clean and in a good location. kids enjoyed sleeping up in the loft. Immaculately clean, nice welcome and huge motel room with a great spa. Perhaps one of the best Motels I've come across in New Zealand! Only con was a pretty dismissive no when asked for a extra hour for a late check out. Manager initially considered it then stated that as they were 'to busy' so no late checkouts were being given to anyone which seemed to be a instinctive not overly well thought out decision as not all rooms can be cleaned at same time so some late checkoutas could easily have been granted. But overall great place and would not hesitate to recommend and would most definitely stay there again. Exceptionally friendly and outgoing staff. We drove to Rotorua directly after arriving from BNE and we were so happy to relax in our own Spa tub which was behind the room we stayed. Made us forget the hours of travelling and driving down in no-time. 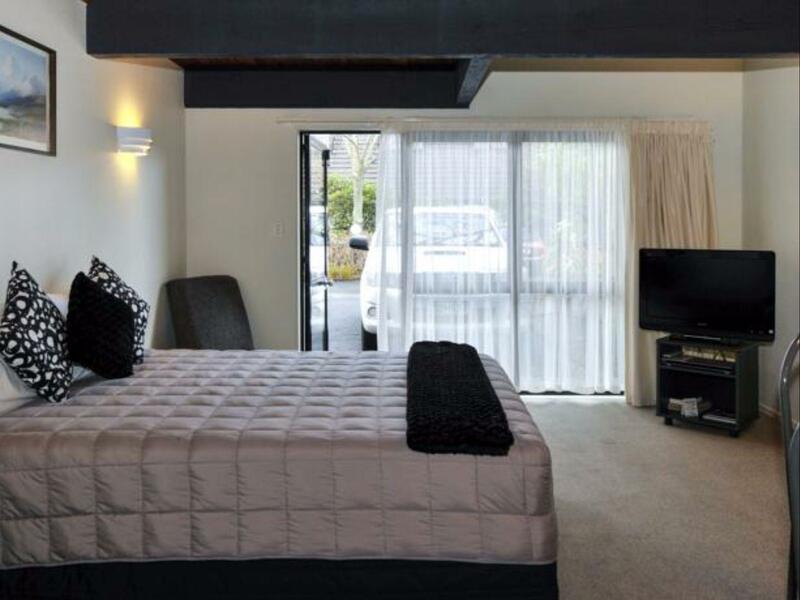 Room was extremely spacious and I will definitely come back to stay at this place when visiting Rotorua again. Very good. There was lots of space and a nice lounge area, separate from the bedroom. At the start I thought the room was going to be hot and stuffy, especially as the fan was too noisy to use at night but this turned out not to be the case despite limited ventilation options. The hot tub was in a very uninteresting back shed arrangement but the outdoor pool provided a much more attractive place to take a dip in the warm water. There was poor ventilation in the unit. Either the carpet or the bathroom smells. Thank God, it was only 1 nite. 1. private chill out pool at our backyard; 2. friendly staff. 3.good kitchenette.